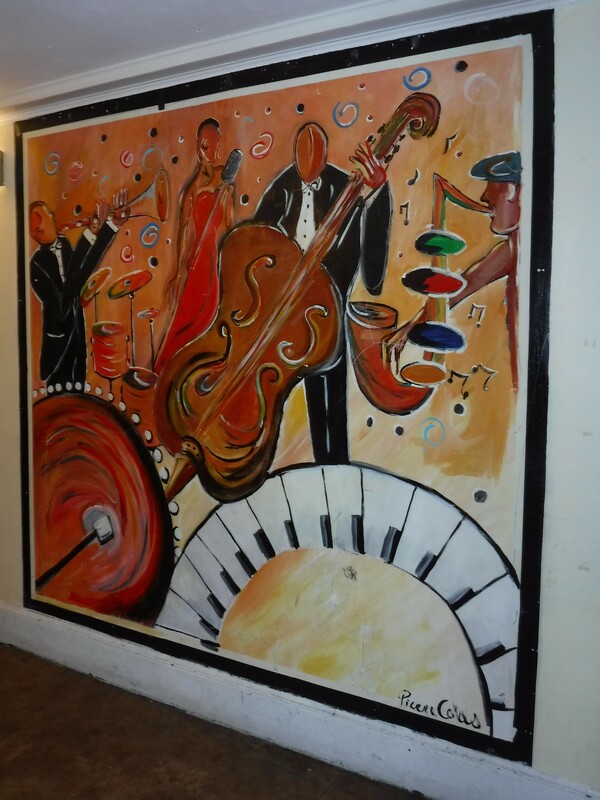 Artwork in Lobby of Brooklyn Music School. Photo by Judy Pantano. The Metro Chamber Orchestra is currently in its 14th season. Maestro Philip Nuzzo is the founder, Artistic Director and Principal Conductor, Deborah Surdi is the Executive Director and Nathaniel Chase is the Assistant Conductor. 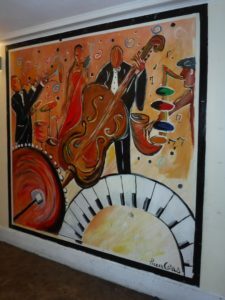 The Brooklyn Music School is located at 126 St. Felix Street around the corner from the Brooklyn Academy of Music (BAM) and has ambitious plans for its 15th season which begins in October. On the evening of Saturday, May 6th, Maestro Philip Nuzzo began the concert with Siegfried Idyll by Richard Wagner. I was familiar with the piece having heard it via radio with the legendary conductor Arturo Toscanini (1867-1957) and the NBC Symphony. Richard Wagner (1813-1883) composed this piece as a birthday surprise for his second wife Cosima,(1837-1930) who was born on Christmas Eve in Como, Italy. Originally this rustic work was performed with 13 instruments and later its orchestra size was doubled. With the sounds of nature, leaves rustling, birds chirping, one can envision young Siegfried, rubbing his eyes to horns heralding the new day. The trembling of a leaf, the fleeing of a stag, salmon swimming upstream, the silence of a deer. All were heard in this piece which was incorporated in part, in his opera Siegfried. It still remains as a testament to Richard Wagner and his Cosima, who herself was a “love child” of Franz Liszt and his Baroness mistress Marie d’Agoult. One heard all this and more in the subtle, ever ascendant beat of Maestro Nuzzo who built this tone poem into a resplendent tsunami of love and spring eternal. The members of the orchestra played with intense dedication and unity. Maestro Philip Nuzzo and Orchestra. Photo by Judy Pantano. Next came selections from “El Amor Brujo” by Manuel de Falla. 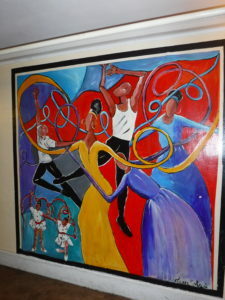 (1876-1946) It is called “Broken Love” and it features the Fire Dance. I looked at some of the musicians just before they began playing and they had a look of anticipation and exaltation, eager and ready to express the passions of this great work. Maestro Nuzzo’s strong and steady beat ensured us of a passionate reading of this sumptuous score and he and the musicians nailed it right on the head. I envisioned an MGM musical with José Iturbi or an early TV show with Liberace hitting the keys on a flame filled piano! The Spanish born Manuel de Falla evokes Grofé, Thompson, Copeland, Gershwin and others of his era who used vivid and graphic ornamentation to absorb audiences right into the fabric of their music. Not Hollywood type “faux” Spanish music but the “real deal,” penetrating the soul of the listener. The main theme with its dark dramatic minor key repetition and pizzicato sections triggered off the Fire Dance and carried us along this magic carpet journey. The second part of the program was a concert version of a one act opera by composer Philip Hagemann entitled RUTH. According to Shavuot: “The Book of Ruth is the eighth book of the Old Testament of the Bible. A short story, it tells how Ruth, the Moabite widow of a Bethlehemite, with her mother-in-law Naomi’s assistance, married an older kinsman Boaz, thereby preserving her deceased husband’s posterity and becoming an ancestor of King David.” Ruth and Orpha are sisters and daughters-in-law to Naomi. Cast of Ruth with composer Philip Hagemann. Photo by Judy Pantano. Ruth is indeed a victim that the drama swirls around. The music by Philip Hagemann is not atonal or melodic but rather sweeping and harmonious. It is not film music but evokes and impresses. It is an opera in brief that deserves to be a strong part of the contemporary operatic firmament. 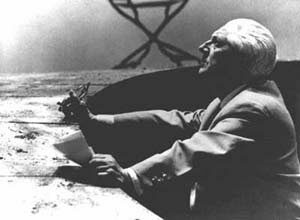 Hagemann has written ten short operas and several full length ones that bear listening. Jessica Mirshak used her warm mezzo and stretched the envelope to indicate the sturm and drang of her character Naomi. Ms. Mirshak is the possessor of a mellifluent mezzo-soprano. Ruth, sung by Alyson Spina’s soaring soprano, made for a vocally and histrionically satisfying reading. Ms. Spina gave generous portions of her soprano plus a blend of defiance and resignation that was noteworthy. Deborah Surdi used her beautifully polished soprano and floated some really impressive notes as Orpha. Boaz was strongly sung and acted by Stan Lacy whose lyric baritone negotiated the byways of this role with passion and ease. Theodore Chletsos as the servant/Amnon showed his inner Canio with a splendid tenor of squillo and abandon. Tenor Christopher Tefft joined the chorus and blended well. The Greek Chorus consisted of Jessica Doolan, Amal-El-Shrafi and Victoria Rodriguez. They made for a tantalizing trio of future Rhine maidens. Maestro Nuzzo did a masterful job making the singers and orchestra play as one and showing his mastery of the music and its genre. Maestro’s code seems to be “to thine own self be true” and he conducts what he likes best! Back row-Dr. Jerry Stolt, Midge Woolsey, Murray Rosenthal, Ella Godfrey, Philip Hagemann, Nino Pantano Bottom Row-Deborah Surdi & Eve Queler. Photo by Judy Pantano. In the audience were famed Maestro Eve Queler from the Opera Orchestra of New York, Midge Woolsey, spokesperson from PBS’s Channel 13 and former radio host WQXR with her husband Dr. Jerry Stolt, economist, Brooklynite Ella Godfrey formerly from the Met Opera broadcasts, Murray Rosenthal, Treasurer of Opera Index and Philip Hagemann, Vice President of Opera Index and the composer of Ruth who received an ovation. Mr. Hagemann is the longtime director of the Rockland Choral Society and is also the composer of Fruitcake, a well known whimsical and popular choral work. The Metropolitan Opera included the Brooklyn Academy of Music as part of its tour until 1937. All the great vocal artists appeared at BAM. On December 11, 1920, Enrico Caruso collapsed on the stage of BAM after suffering a throat hemorrhage during a performance of Elisir D’amore. After a lengthy illness, the great tenor passed away at age 48 in his native Naples, Italy on August 2, 1921. It was a rainy chilly evening but we all went to the nearby Berlyn Restaurant to celebrate over libations and sweet edibles. It was the ever young Indiana born composer Philip Hagemann’s night and many a glass was lifted in his honor. Our waitress Anna Schumann gave us impeccable service! We look forward to future performances by this superb ensemble of Metro Chamber Orchestra. 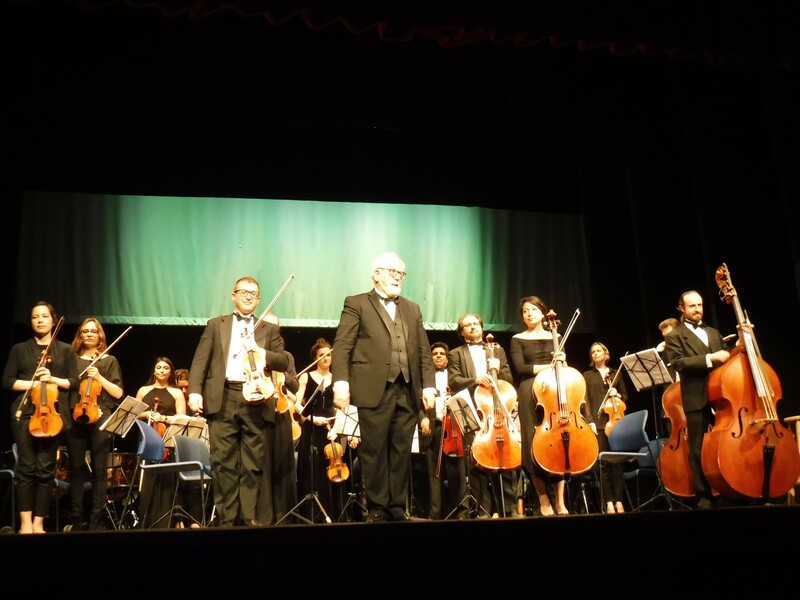 Maestro Philip Nuzzo has conducted in Italy and many international venues. A tree grows in Brooklyn and tonight it was a giant oak! 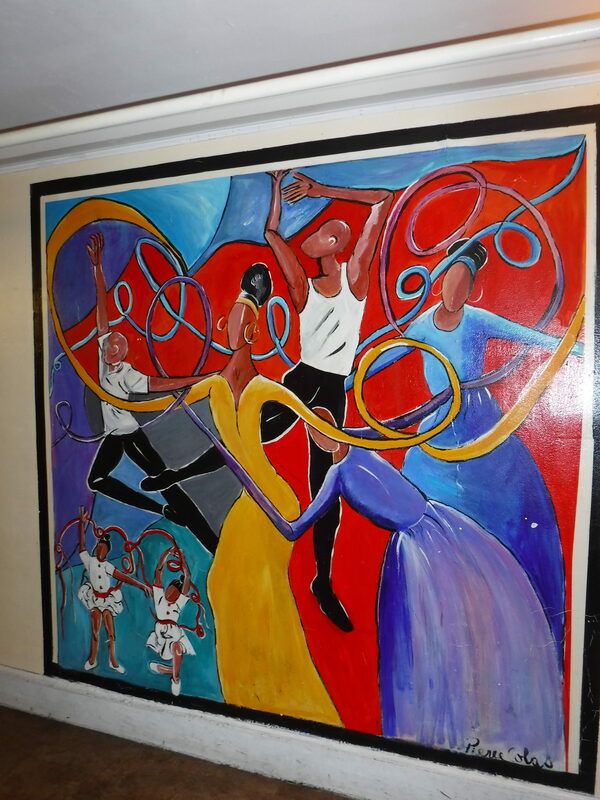 Art Work in lobby of Brooklyn Music School. Photo by Judy Pantano. One critic wrote “you could tell the quality of a forthcoming performance by the amount of food spilled by excited fans in the local cafeteria.” This was written at the Metropolitan Opera debut of legendary soprano Magda Olivero age 65 in 1975. 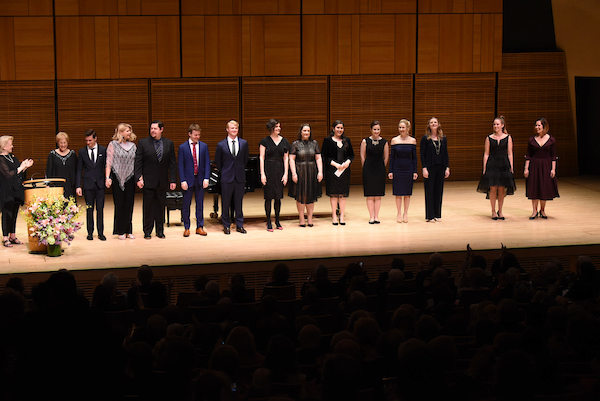 Such was the excitement of the crowd at Zankel Hall in Carnegie Hall in New York City (but without spilled food) on Sunday, April 30th when the Gerda Lissner Foundation, in association with the Liederkranz Foundation, presented concert winners of the International Vocal Competition for 2017. Stephen De Maio President of the Gerda Lissner Foundation. Photo by Don Pollard. Stephen De Maio, President of the Gerda Lissner Foundation started the afternoon by proudly thanking his board members as well as the singers for their prodigious efforts and hard work and the Liederkranz Foundation for its joyful collaboration. 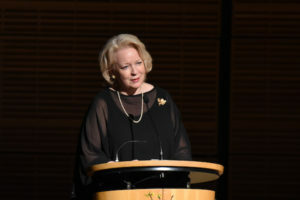 Famed radio (WQXR) and Channel 13 effervescent personality Midge Woolsey, was the host and spoke eloquently of her love for opera and the human voice. 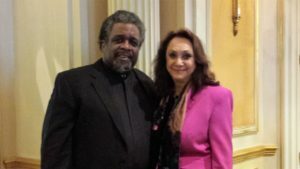 Her current development work is for the concert series at St. Thomas Church at 5th Avenue in New York City and her activities with the Martina Arroyo Foundation. In her spare time, Midge loves to travel with her husband, economist Dr. Jerry Stolt and is thankful for the love they have been blessed to share. 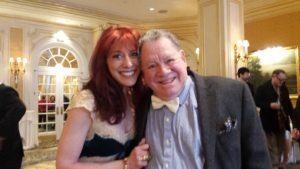 Metropolitan mezzo, the radiant Susan Graham was honored and regaled the audience with some of her adventures here in NYC with a cab driver right out of a 1930’s movie à la Lionel Standler with a quizzical attitude and Brooklyn-type charm. She also told the young awardees to stand back until the time is ready. Ms. Graham’s recent “fairy tale” marriage to a long time suitor Clay Brakeley made happy headlines in the wedding section of the New York Times. 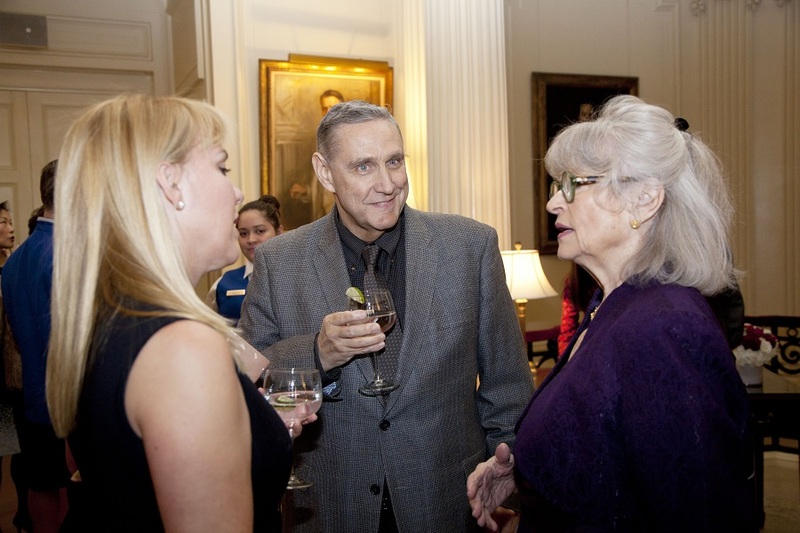 Composers Penny Leka (Knapp), Philip Hagemann and Met Opera Mezzo Honoree Susan Graham. Photo by Don Pollard. Next was a spirited rendition of “Vous, qui faites l’endormie” from Gounod’s Faust sung by Joseph Barron (Second Prize-Gerda Lissner) who gave us Gounod’s devil, well served and savory. Barron’s captivating laughter had just the right balance between wickedness and cynicism. Google this aria from the 1953 filmTonight We Sing, where the legendary basso Ezio Pinza sings it. It will make one happy that this great tradition continues with Joseph Barron! We need more “dark” voices. 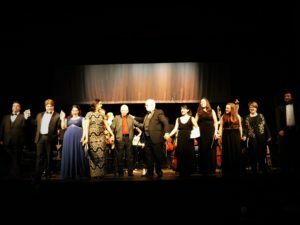 The concert continued with a “bright” voiced Maria Brea’s (Second Prize-Gerda Lissner) sparkling singing of “Chi il bel sogno di Doretta” from Puccini’s La Rondine. Ms. Brea revealed a lovely, lyrical, soaring soprano who under the surface, is scratching the romantic and vulnerable heart that is behind the facade, the far away dream that represents the notion of true love. Ms. Brea captured this like a rose within a white glove and gave it to one and all! Corrie Stallings (First Prize-Gerda Lissner) captivated us with “Que fais-tu, blanche tourterelle” from Gounod’s Roméo et Juliet. It was sung with sophistication and elan. It was utterly Gallic in a beguiling way, evoking actress Veronica Lake in a film noir. Ms. Stallings’s dazzling coloratura cadenza ascent trill and descent took one’s breath away – visually and vocally stunning. Angela Vallone (First Prize-Gerda Lissner) who continues to gather many laurels with her performances, never fails to enchant. Her sublime singing of “Azaël! Azaël! Pourquoi m’as tu quittee?” from L’enfant Prodigue by Debussy placed her “out of the commonplace and into the rare” (Stranger in Paradise Kismet) with a mood inducing, emotion ladeling, soul searching performance. Ms. Vallone’s special soprano gifts have earned her very high marks and a growing group of admirers. I see her in Puccini roles down the golden paved highway! Angela’s proud parents, Anthony and Maria and her handsome fiancee were truly overjoyed. Australian tenor Alisdair Kent (First Prize-Gerda Lissner) once again proved that tapping “down under” there is vocal gold. He gave us a dazzling and magical performance of “Je Croix Entendre Encore” from Bizet’s early work Le pecheurs de pêrles. Mr. Kent has a voice of incredible sweetness, subtly seductive with sublime pianissimi and conjured images of a brilliant bubble floating towards the heavens creating moments of total immersion in the delicate and beautiful. The excellent piano accompaniment of Jonathan Kelly (Courtesy of the Metropolitan Opera) ensured perfection and strong support. After a brief intermission, part two of the program began with “Weiche, Wotan weiche” from Das Rheingold by Wagner sung by mezzo soprano Suzanne Hendrix. (Second Prize-Liederkranz Foundation) Ms. Hendrix is the possessor of a dark rich powerhouse mezzo with cavernous sound. One thought of Helen Traubel or the equally cherished Ernestine Schumann-Heink (1861-1936) whose Met farewell at age 71 was as Erda in Das Rheingold-then off to Hollywood for her screen debut in Here’s to Romance with dashing Met Opera tenor Nino Martini in 1935. Polish soprano Alexandra Nowakowski (First Prize-Gerda Lissner) sang “Où va la jeune Hindoue” (The Bell Song) from Delibes’s Lakmé. This aria was sung in the past by coloratura soprano Lily Pons (1898-1976) whose piquant voice and chic elegance catapulted her to Hollywood fame. Before her appendectomy, Pons exposed her navel in Lakmé and also won raves. Ms. Nowakowski has a large coloratura sound à la Joan Sutherland but is capable of some wonderful shading and fine spun pianissimi. Her formidable trill was golden age in its execution. Polish diva Marcella Sembrich was the possessor of a phenomenal trill. The Semrich Museum in Bolton Landing on Lake George is open in summer and is a gem! Mme. Sembrich (1858-1935) would have been very proud of Alexandra Nowakowski. Mme. Sembrich was the Gilda in Caruso’s Met debut in Rigoletto November 1903. Emily D’Angelo mezzo soprano (First Prize-Gerda Lissner) sang a sly, coy and saucy rendition of “Contro un cor che accende amore from Il barbiere di Seviglia by Rossini. Her marvelous subtle acting evoked the gamin presence of Judy Garland and Liza Minnelli. She conquered the machine gun staccato and coloratura passages of this whirlpool piece and sealed it with an adroit combo of stylistic grace, virtuoso caprice and warm amber intonation. It was a Rossinian revolution and revelation! Lawson Anderson bass baritone made an indelible mark in Wagner’s “Abendlich strahlt der Sonne Auge” from Das Rheingold. Anderson is an Atlanta, Georgia native. He had a striking Teutonic-God like appearance and his richly textured bass had a rare combination of nobility and power perhaps unheard since the legendary Friedrich Schorr. No wonder he was given first prize by the esteemed Liederkranz Foundation. Andre Courville, (the top prize Liederkranz Foundation winner), regaled the audience by strolling down the aisle singing “Air du Tambour-Major” from Le Caid by Ambroise Thomas. Courville then climbed on stage with athletic grace and serenaded my wife Judy (in the first row) in a brief unforgettable moment before resuming his triumphant march onstage. His flourishes, dazzling coloratura and posturing, vocal power appeal made him a true disciple of the genre. It was an energizing treat and a vocal firework show! Mr. Courville who hails from Louisiana will help restore the tradition started with legendary Met basso Pol Plancon. His top prize Gerda Lissner award was proudly presented by Barbara Ann Testa, trustee. Lastly, Vanessa Vasquez (top prize Gerda Lissner Foundation) was presented with the award by Susan Graham. The familiar “Un bel Di” from Puccini’s Madama Butterfly was her offering. She sang this aria as a personal testament, bringing the audience along the journey. She followed the musical line perfectly as if you were reading her personal thoughts. Her whispers flew through the house like pellets of doubt but were cast aside by triumphant and hopeful ideas. Ms. Vasquez sang on the word as the great past Butterfly, Licia Albanese would have strongly recommended. By the time she hurled out her final notes, we were already part of Butterfly’s journey. Ms. Vasquez transformed herself from a Colombian beauty to that petite Japanese girl. She was so in character that it took a while for she and the audience to regain composure. A stunning performance! A grand ovation! The pianist for the second half of the program was the indomitable and gifted Arlene Shrut. Her husband Gary Kendall is her number one fan and his robust basso laughter gives Mephistopheles some competition! A this point, the audience strolled two blocks to celebrate these future stars of opera at a sumptuous dinner at the New York Athletic Club on Central Park South. There were several hundred guests at this event and what a joy to “meet and greet before we eat” at this formidable happening. We spotted photographer Don Pollard and reviewer Meche Kroop. Cavaliere and Perugia’s poet Edwardo Jackson, Mario Lanza Society’s Bill Ronayne, opera lecturer Lou Barrella and wife Cathleen, the ever youthful Brooklyn born soubrette soprano Elaine Malbin, soprano-lecturer Jane Marsh, Gloria Gari from the Giulio Gari Foundation, Met Opera legend dramatic soprano Elinor Ross, Kennedy Center honoree and pioneer Martina Arroyo whose foundation paves the way with “Prelude to Performance” at the Kaye Playhouse at Hunter College, “Mr. Opera” broadcaster vocal coach Ira Siff and Hans Pieter Herman whose recent cabaret show entitled “The Flying Dutchman” was delightful and a big hit at the Pangea Club in New York City. We missed Ira Siff’s great character, Madame Vera Galupe-Borszkh from La Gran Scena Opera who surely would have been among the opera legends of the evening. It was great to see the gallant Glenn Morton, Artistic Director from Classic Lyric Arts, Brian Hunter, President of the Musicians Club of New York and of course the industrious and ever busy Stephen De Maio, President of the Gerda Lissner Foundation with the ebullient Michael Fornabaio, Vice President and Treasurer, the effervescent Cornelia (Conny) Beigel, Secretary and Trustee, Karl Michaelis ever dapper and the affable Barbara Ann Testa, Trustee. Ever chic Joyce Greenberg, who as competition assistant was the herald calling so many young singers before being judged and Sonja Larsen, also competition assistant. 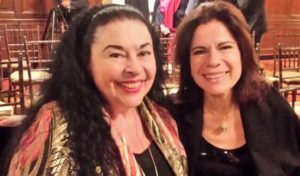 Diva and ageless Met legend mezzo Rosalind Elias and unforgettable ever vibrant Met soprano and now coach Diana Soviero. Famed Met mezzo and Opera Index President Jane Shaulis with husband Executive Director Joseph Gasperec, Vice Presidents Janet Stovin and composer Philip Hagemann, Treasurer Murray Rosenthal and Christine and Alfred Palladino from the Columbus Citizens Foundation added their special vitality to the mix! It was nice to see Philipp Haberbauer, General Manager from the Liederkranz Foundation, vocal coach Robert Lombardo, impressaria Diane Curci from Bensonhurst, beacon and pioneer Maestro Eve Queler from the Opera Orchestra of New York and Maestro Jan Wnek, vocal coach Arturo Colaneri, proud Brooklynite, opera manager Ken Benson, vocal coach Tami Laurance with rising young tenor José Heredia, evocative soprano Patricia Kadvan, from the New York Grand Opera, tenor/actor Anthony Laciura, opera autograph’s Bill Safka, Betty Cooper Wallerstein glowing patron and community activist, sparkling Don di Grazia, head of the Met Opera’s Patrons Box Office and charming wife Chi hosting her sister Lily Rudel. 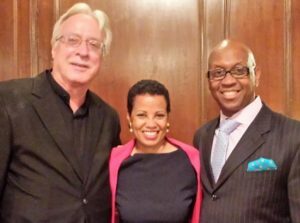 We thank Stephen De Maio and the Gerda Lissner Foundation for their noble quest to find and nurture operatic voices and Joseph Pfeifer of the Liederkranz Foundation and the Max Kade Foundation, Dr. Lya Friedrich-Pfeifer, President. The superb dinner was by Openskies Hospitality Catering Service. Judy, myself and our guests will carry happy memories of this almost surreal exposure to a world of harmony, love and beauty for years to come! Gerda Lissner’s dream continues to come true as young talented future opera stars take off like dazzling fireworks to grace the future operatic heavens and ensure us of many more glorious sunrises! 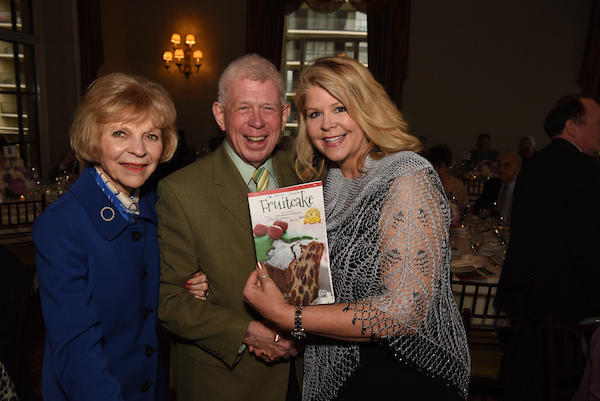 On the afternoon of Sunday, April 2nd at the JW Marriott Essex House in New York City, the Martina Arroyo Foundation held its Spring Luncheon. 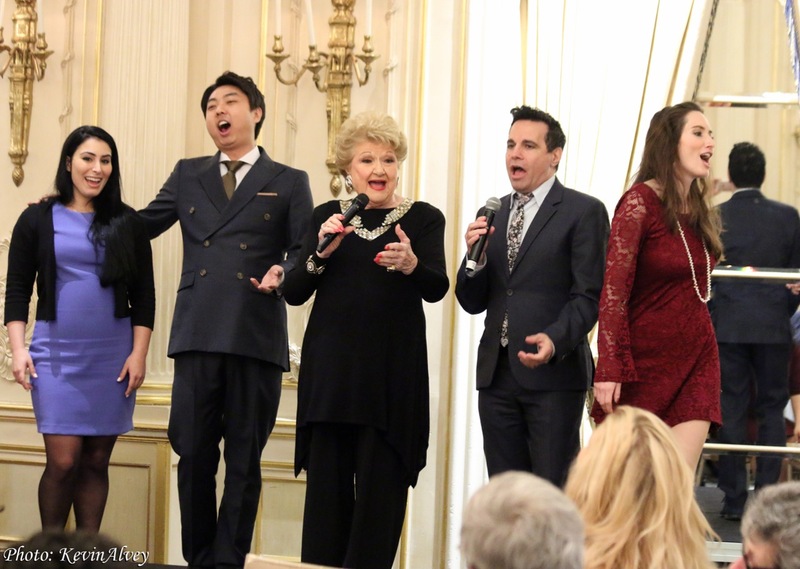 The luncheon featured a special cabaret performance by Marilyn Maye and Mario Cantone with present and past Prelude to Performance artists. The glittering crowd consisted of the shakers and breakers in the world of Broadway, opera and fashion. A dazzling potpourri of the doyennes, legends and admirers. It was a love boat that took us to exotic ports and entertained us royally. The auction featured everything from rock guitars to music memorabilia. 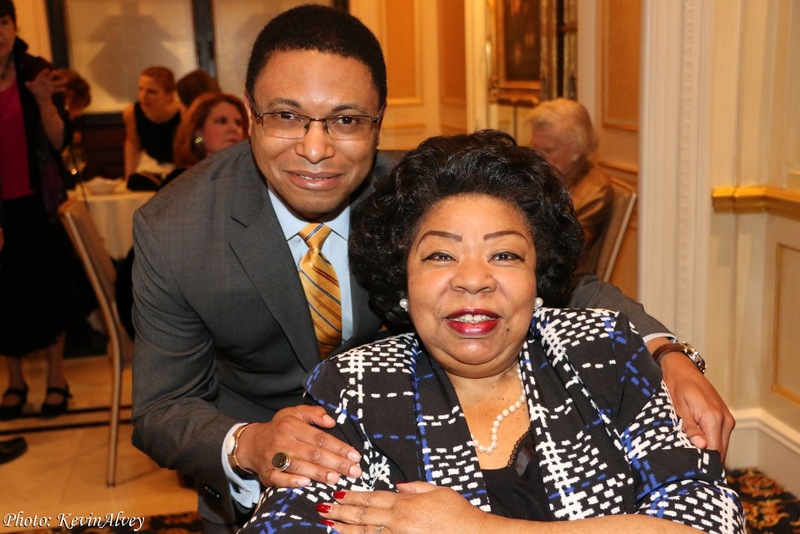 Doug Wood of the Ford Foundation & Soprano Martina Arroyo. Photo by Kevin Alvey. The concert began with mezzo soprano Magda Gartner singing the “Seguidilla” from Bizet’s Carmen. Ms. Gartner’s voice has exceptional clarity, agility and a “cutting edge” that rivals how Carmen can cut a man and discard him like a shucked clam! Slam bam, shucked clam man! A very tantalizing hors d’oeuvre of what Ms. Gartner’s complete Carmen will be! Saucy soubrette soprano Shana Grossmann was a particularly engrossing, piquant and ingratiating daughter as she sang an exquisite “O Mio Babbino, Caro” from Gianni Schicchi with subtle winsome gestures that made for an unforgettable operatic moment. Her clinging to the final “Pieta” made for great theater and a tiny humble gesture of appealing to her Daddy was the whipped cream on the Sunday, sundae! Tenor Woo Young Yoon will soon be “the triumphant tenor talk of the town” for his splendidly lyrical and heartfelt singing of the Flower song from Carmen. His high note was caressed, swelled and diminished beautifully and the tender side of this future erupting volcano was bared unashamedly for Carmen, his delicious arsenic soaked peach! How could she not be moved by his singing of this aria? I know the audience was! Shana Grossman (from left), Woo Young Yoon, Marilyn Maye, Mario Cantone & Magda Gartner. Photo by Kevin Alvey. Metropolitan Opera conductor Steven Crawford was the brilliant piano accompanist. The salad was served as we recalled our “salad days” followed by a chicken dinner as we watched a cool young “red hot mamma”, Marilyn Maye and her superb trio for an afternoon of CABARET! The Marilyn Maye trio with Jeff Davis on piano, Tom Hubbard on bass and Daniel Glass on the drums took us back to the days when cabaret was where one took his date. 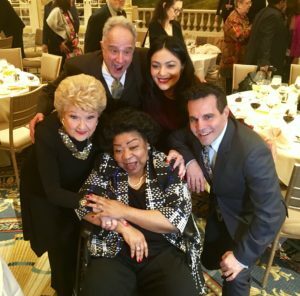 Marilyn Maye, Martina Arroyo, Mario Cantone Anthony Laciura & Ailyn Pérez. Photo by Kevin Alvey. Marilyn Maye, looking dazzling, admitted to being 89 which just defies mortality. It might have well been sweet 16, legal 21 or sizzling biological “peak” at 39. Her fulsome singing-and I mean SINGING, showed a voice of clarity and power, elegance and finesse, singing on the word and belting them out like Caruso, Ethel Merman and Babe Ruth – a home run every time! For a starter, a rousing “It’s a Most Unusual Day” and a medley of the familiar and not so familiar, “It’s Spring Again” awakened one as “O Paradiso” from Meyerbeer’s “L’Africana” would – full of newfound joys of new horizons! Her youth became our adrenalin in “That’s All!” which was a blend of irony and insouciance and Artie Butler’s “Here to life ” was a rich tapestry of all that was and is yet to be. “Somewhere over the Rainbow” took us to that rainbow and was sung with all the hopes and dreams of mankind and the colors of the rainbow in her voice, so fresh and full of hope. Marilyn Maye had us all lift our glasses in a salute to life! An unforgettable moment! Then to everyone’s delight, she shared the stage with the brilliant comedian whose Broadway one man show was acclaimed, as well as his television and film work. Mario Cantone sang “I’m Gonna Live Till I Die” with all the enthusiasm of a tarantella at a Sicilian wedding! Mario and Marilyn sang “When You’re Smilin’ ” with real pizzazz. It’s one of my favorite “old” songs and was the theme of “The Alan Courtney” radio show (WNEW) back in the 1940’s. 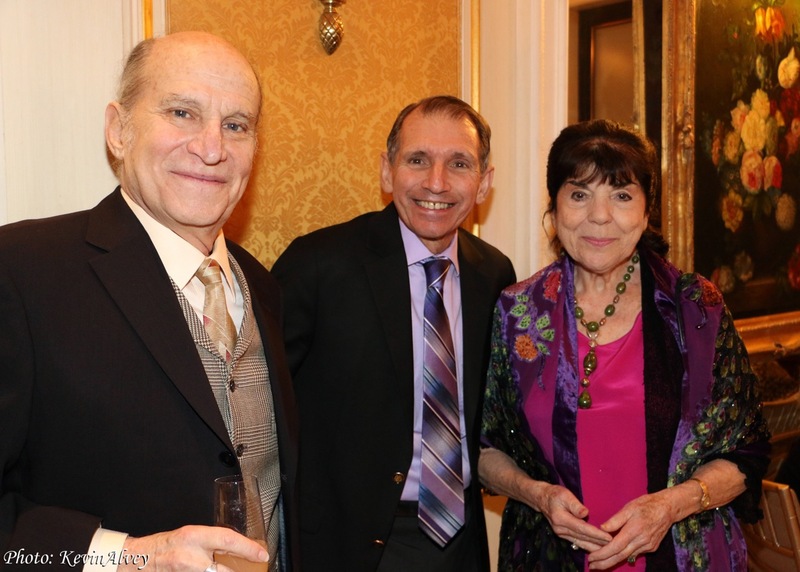 Host Stephen Mo Hanan, Opera Index Treasurer Murray Rosenthal & Maestro Eve Queler. Photo by Kevin Alvey. 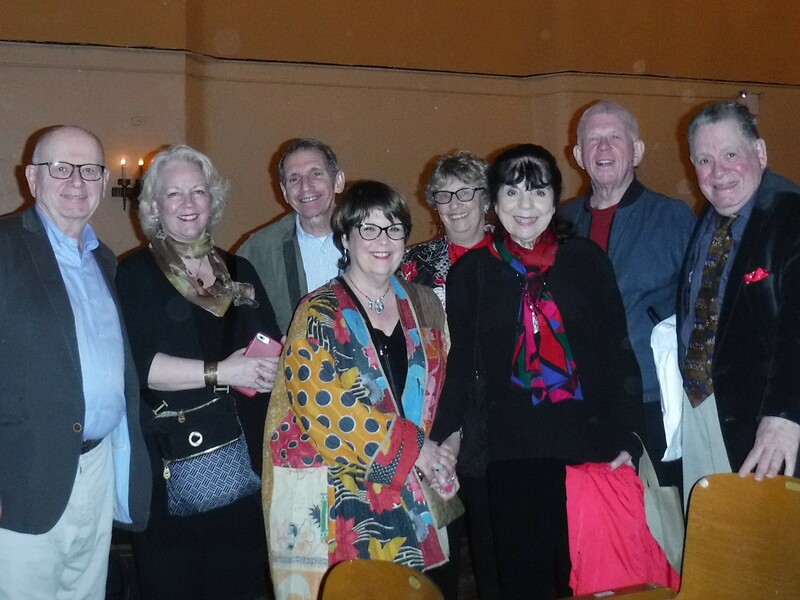 We had a lovely table with our special host Murray Rosenthal, composer Philip Hagemann, soprano Elaine Malbin, Met mezzo Jane Shaulis and President of Opera Index, her spouse, Executive Director Joseph Gasperec, Vice President Janet Stovin and Maestro Eve Queler of The Opera Orchestra of New York. Met Baritone Mark Rucker & Sadie Rucker. Photo by Judy Pantano. In the crowd, we chatted with acclaimed Met Verdi baritone Mark Rucker who also coaches the awardees for Prelude to Performance and his invaluable wife and accompanist Sadie who helps promote the great Martina Arroyo Foundation as well as the effervescent Norena Barbella who is the Producer of Talent, Music & Live Entertainment. 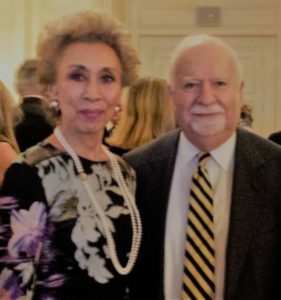 Andrew Martin-Weber and Beatrice Disman are active Board Members of the Foundation also. Talent Producer Noreen Barbella & reviewer Nino Pantano. Photo by Judy Pantano. Of course legendary Met opera soprano Martina Arroyo was present, and welcomed all at the beginning of the program, the founder of the feast, looking radiant and proud and we paid special homage to this great lady and recipient of the Kennedy Center honors. We all look forward to Prelude to Performance in July at the Kaye Playhouse at Hunter College with Carmen and Gianni Schicchi. Both Bizet and Puccini are brilliantly served by the young and gifted nurtured awardees of the Martina Arroyo Foundation. Martina’s Dad Demetrio, was an engineer at the Brooklyn Navy Yard to support his family and assist young Martina’s career and music lessons. It was nice to chat with Maestro Stephen Phebus and his wife Linda Howes, Cavaliere Eddie Jackson, spectacular soprano Ailyn Pérez, Met Opera tenor comprimario and television star Anthony Laciura and his wife Joel. He is a fellow Sicilian also lovingly called “Ninutzu” as a child by his adoring family! Judy and I honeymooned at the Essex House Hotel nearly 51 years ago! So to me, at least two events at this venue, fifty years apart will forever be enshrined in my memory bank! The interesting program booklet included greetings from Dr. Kerstin Weinbach, City Councilor and Head of the Cultural Department forthe Magistrate City of Marburg, March 2017. The letter announced a newly opened cultural institution bearing the name Erwin Piscator Haus. Piscator went to school in Marburg and returned there in 1951.The new building replacing an older one proudly bears his name and continues his work. After the wine and cocktail reception, the program began with soprano Jeannie Im singing “An die Freude” (Ode to Joy) music by Franz Schubert from a text by Friedrich Schiller. Ms. Im has been with Elysium since 2000 and was in the premiere performance of Ernst Krenek’s “What Price Confidence” at the Teatro dell’ Opera di Roma co-produced by Elysium. Among her many performances under the auspices of Elysium, were concerts of works by performers who were exiled or killed in World War II. Matthew Lobaugh, who is the Music Director of the New York City Wide Youth Opera, was her versatile piano accompanist. Ms. Im strolled through the tables and sang in a clear commanding soprano with joyful abandon. Michael Müller, the Mayor of Berlin had his representative, Ms. Katja Weisbrock Donovan, who is the head of Cultural Affairs at the German Consulate in New York, bring greetings and speak of the cooperation of the two cities – Berlin and New York. She mentioned the Kellen family who were forced to flee Berlin during the era of the Nazis and the importance of Erwin Piscator and Maria Ley Piscator to the world. 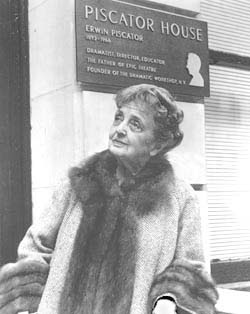 The New York Theatre Workshop founded by James C. Nicola a pivotal influence as well. Michael Lahr was the Program Editor and key to this joint effort and of the of the two countries under the banner of art and enlightenment. The dream turned into a reality of Gregorij H. von Leïtis and Michael Lahr. proudly introduced the chairperson of the luncheon committee, Louise Kerz Hirschfeld, whose late beloved husband Al Hirschfeld, was the Da Vinci of caricaturists. Ms. Hirschfeld’s energetic defense of the arts and its importance to all, made one think of “The Line King” a wonderful, whimsical documentary of her late great husband. A fascinating musical excerpt followed, colorfully sung by soprano Jeannie Im “Lied von der Tünche” (Song of Whitewash) with music by Hanns Eisler and a text by Bertolt Brecht. The music evoked the German cabaret offerings of Lotte Lenya and the school of cabaret in the style of The Threepenny Opera. Matthew Lobaugh’s facile accompaniment made the two, one. The salad was served and now the “salad days” prevailed. Michael Lahr, the erudite and industrious Chairman of the Erwin Piscator Awards Committee spoke. As a specialist of Erwin Piscator, the founder of the political and epic theater, Lahr brilliantly curated the exhibit Erwin Piscator: Political Theater in Exile andit traveled to Bernried, New York, Catania, Salzburg and Munich. Lahr spoke of the great joy and importance of the occasion and introduced the famed playwright Tony Kushner. 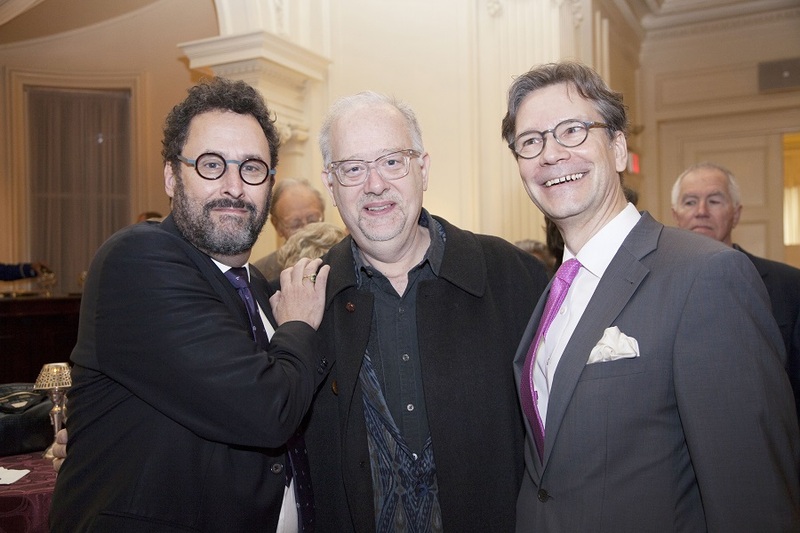 Tony Kushner, Doug Wright, and Michael Lahr. Photo by Letizia Mariotti. Mr. Kushner alluded to the dark days we have been witnessing of late and how the arts will pave the way for better days ahead. 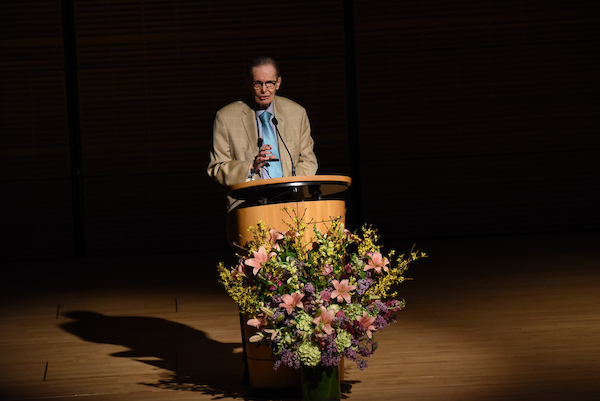 He referred to an earlier era in Greenwich Village and elsewhere when Belafonte, Brecht and Brando championed causes and spread the word of enlightenment and creativity. They knew where they were going artistically and emotionally as did James Nicola in his early days at the studio, which has become a kind of mecca, a place “Where one can roll up in like a blanket” (Fanny). Tony Kushner spoke in staccato sentences like a prizefighter hammering away at the evils of the world and praising the good in his introduction for James C. Nicola. Gregorij von Leïtis made the presentation to James Nicola,”for his enormous contributions to the American theater by producing and cultivating artists whose works inspire and challenge the public.” As Artistic Director of the New York Theater Workshop since 1988, Nicola has forged a unique community of theater artists, a group of writers, directors, designers and actors who form the core of NYTW’s artist development activities. Many plays, premiers including Tony Kushner’s “Angels in America” and “Homebody/Kabul” as well as Tennessee William’s “A Streetcar Named Desire” were performed. James Nicola spoke intimately and passionately about his boyhood desire to excel in theater and his lack of concentration on other subjects. Nicola’s somewhat perturbed parents granted him the right to pursue his goals but he had to measure up academically to attain them. Nicola feels theater is “a sacred light” and that it illuminates the soul. Artists are encouraged to play their chosen destined roles. A force of nature illuminated by a “splendid torch,” a force of nature not to be denied. James Nicola is motivated by a sacred flame and that light has brightened the world. Heather Randall (from left) with James Nicola and Louise Kerz Hirschfeld. Photograph by Letizia Mariotti. With so much at “stake” we proceeded to enjoy our delectable choice of steak (or salmon), having feasted on brilliant words and deeds from the hearts and minds of the mighty. 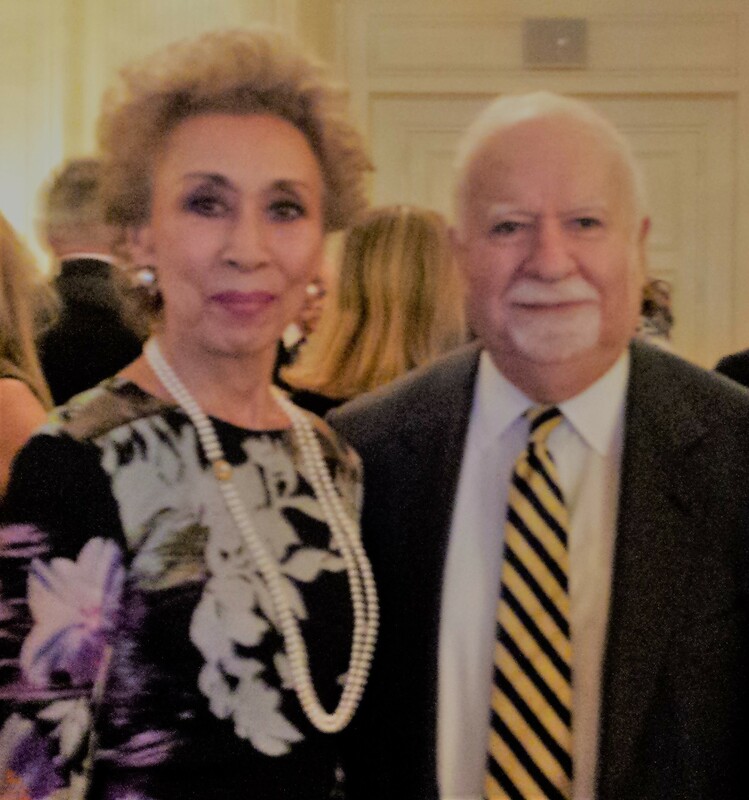 Vartan Gregorian is the 12th President of the Carnegie Corporation of New York, a grant making institution and is also a past honoree of the Erwin Piscator award. He is best known for his outstanding service as President of the New York Public Library. (1981-89) His services have earned him nearly 70 honorary degrees.The brilliant Mr. Gregorian spoke eloquently on behalf of honoree Marina Kellen French. With joyful abandon and as Elizabeth Barrett Browning wrote “How do I love thee?” Mr. Gregorian alphabetically listed all of Marina Kellen French’s virtues practically from “A to Z” and why she is so admired. Whether it be art, music, medical, literary, educational, she is there to lend support, advice and encouragement! Gregorij von Leitis with Marina Kellen French. Photo by Letizia Mariotti. Gregorij von Leïtis presented Marina Kellen French with the Erwin Piscator award “for so generously giving of her time and talent to support so many artistic, cultural and educational organizations both here in New York and in Berlin.” Ms. French spoke of the joys of giving and that it must be earned and of her two unforgettable years as a student in Berlin, the land of her parents birth. The art of philanthropy and of aiding mankind is her mission.” What good is leaving the earth with accumulated wealth but having done little or nothing to help ones’ fellow humans?” That is also the mission of Gregorij von Leïtis and Michael Lahr. That is the path chosen by Marina Kellen French. 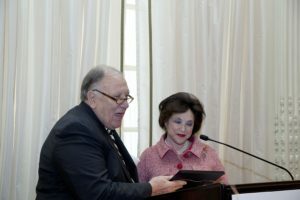 The honorary Erwin Piscator award of 2017 was in memory of Maria Ley Piscator. (1898-1999) In 2014, Ms. French was awarded the Order of Merit of the Federal Republic of Germany at the residence of the German Consul General Brita Wagener in New York City. In a proclamation printed in the program, Governor Andrew Cuomo praised James C. Nicola for his “creative vision to American arts and culture” and Marina Kellen French “for her generous work in perpetuating and preserving a legacy of great art in the world.” Mayor Bill de Blasio also congratulated the awardees and Elysium – between Two Continents in the program with a special proclamation. Jeannie Im accompanied by Matthew Lobaugh sang a lively “Good-Bye Trouble” with music by Mischa Spoliansky and text by Frank Eyton. “I’ve put on my hat, I’ve locked up my flat; the dog’s at the vets, I’ve settled my debts” and concluding with “And if I could design a world, I shouldn’t plan a finer world.” Ev’rything in it I see as it passes Thro’ wonderful rose colored glasses. Good-bye Trouble! I’ve finished with you, Trouble!” With that special “Thank you for coming” from Louise Kerz Hirschfeld, the afternoon drew to a upbeat close as we were enjoying the desserts and sweets of the luncheon – almost redundant when one considers the real “sweets” offered by the words and deeds of the day! Vartan Gregorian was affable and most gracious. He is the “Energizer battery” redux! Louise Kerz Hirschfeld spoke of her husband’s zest for life and creative output. I told her that I especially admired his caricature of the matchless tenor Enrico Caruso (A former Lotos Club honoree in 1916) and the fact that Caruso, who caricatured as a hobby, published several volumes of caricatures. It was nice to chat with Jolana Blau, Vice Chairperson, who was also chatting with Martin Dvorak, Consul General of the Czech Republic in New York, Austrian Consul General Georg Heindl and his wife Neline Koornneef Heindl and the effervescent Midge Woolsey from both WQXR and PBS and her husband economist Dr. Jerry Stolt. Last year’s honoree, President of the Licia Albanese-Puccini Foundation Sachi Liebergesell, was present with General Counsel Brian O’ Connor Esq. and his wife Maura. The lovely intimate Lotos Club is a New York treasure and the perfect venue for this stellar occasion. We wish to thank Gregorij H. von Leïtis, President and Michael Lahr, Vice President for the pursuit of a peaceful world through art and artists and for being such gracious hosts and extraordinary humanitarians. As always, their friendship is treasured. If John Kennedy appreciated Thomas Jefferson dining alone, what about his being in a room full of people – men and women who match that ideal and are gregarious and fun as well. I conclude with a quote from George Bernard Shaw that was referred to during this event, “You see things and you say, “Why?” But I dream things that never were and say, “Why Not?” Bravo to “Elysium – Between Two Continents for daring to ask “Why not?” and for keeping the work and spirit of Erwin Piscator and his wife Maria Ley Piscator alive, ongoing and thriving! 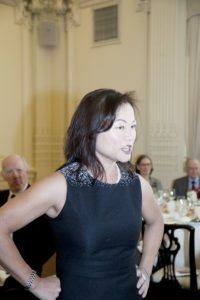 Soprano Jeannie Im. Photo by Letizia Mariotti. The New York Athletic Club on 59th Street and Central Park South was the venue for an unforgettable evening of remembrance and celebration on the evening of Sunday, September 25th. 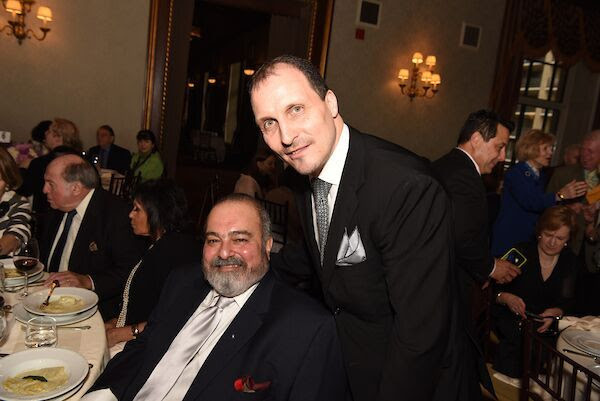 The evening was dedicated to Glen Gary, beloved son of Giulio and Gloria Gari who passed away a few months ago. May his spirit soar as music reigns. Greetings were given by Chairman of the Board Gloria Gari, always a source of inspiration and courage and Artistic Adviser Stephen De Maio who always pans for vocal gold and finds it! Our host of the evening was Brian Kellow who has written best selling books and was famed for his many articles in Opera News. Mr. Kellow instantly draws the attention of those present by his intimate warmth, vast knowledge and great love for opera and people. Kellow introduced the two honored guests beginning with the Metropolitan Opera and Grammy Award winner soprano Ana Maria Martinez who accepted her award with humility and grace. I recall her in concert with Andrea Bocelli and I was dazzled by her clarion angelic voice and its passionate and beautiful qualities. Ms. Martinez, who is from Puerto Rico, is truly an ambassador of opera to the world. Her recent Madama Butterfly at the Metropolitan Opera won rave reviews. Soprano Catherine Malfitano brought back wonderful memories of both the New York City Opera (NYCO) and the Metropolitan Opera (Met Opera) where her acting and singing made for performances of blazing intensity. 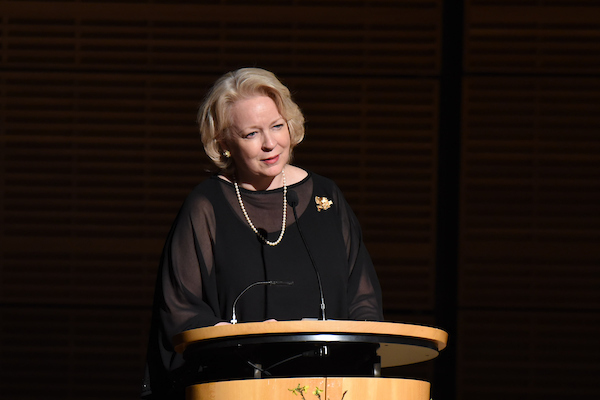 Ms. Malfitano who was born in New York, told the awardees and the audience to “share the passion” and the importance of “words matter.” She is presently both opera director and teacher and her mission continues. Unfortunately Rolando Villazon, acclaimed Metropolitan Opera tenor was unable to attend. Jin Sol baritone sang “Di provenza il mar, il suol” from La Traviata by Giuseppe Verdi. Mr. Sol’s lyric baritone had both ardent and sweet qualities and he used his “brakes” to soften and slow down so that the moments of soft lyrical sound and bursts of intensity were well contrasted. A good and proper job for this beautiful aria. Sol accepted his 2nd prize award from Tarquin M. Callen. The duet from Puccini’s La Boheme,”O soave fanciulla,” was next with soprano Antonina Chehovska and tenor Fanyong Du. Ms. Chehovska’s sweet and ardent soprano was a perfect blend with Mr. Du’s tender tenor and their walking towards the exit while capping the high C had its sealing the discovery of young love in a rhapsodic and indelible moment. Tamie Laurance and Joyce Greenberg from the Gerda Lissner Foundation presented the awards. The quartet from Puccini’s La Boheme followed. “Addio dolce svegliare” with Antonina Chehovska, soprano, Marco Cammarota tenor, Meryl Dominguez, soprano and Andrew Manea baritone. A poignant Mimi, a robust lamenting Rodolfo an exasperated vocally rich Marcello and a vibrant outstanding and sparkling Musetta. A quartet that doubled ones pleasure. Awards were given by Lucia DeRosa, Dr. Philip and Mrs. Frezzo, Robert Fellows Esq. and Dr. Barry Schenk. “O Mimi tu piu non torni” from Puccini’s La Boheme followed with Jamez McCorkle tenor and Norman Garrett baritone. Mr. McCorkle’s ringing tenor voice was captivating as the heartbroken poet and blended with Mr. Garrett’s caressing and mellow baritone. Both cannot focus on their activties because they long for their sweethearts. The blend was as warm as a cappuccino with cinnamon after a jog in the autumn chill. The ever dapper Karl Michaelis presented the award from the Lissner Charitable Fund. On the lighter side, Christopher Magiera stepped in and replaced someone who cancelled and sang “I’m going to Maxim’s” from Franz Lehar’s The Merry Widow and his provocative baritone filled the void with mayhem and merriment. Magiera’s instrument has power, color and vitality and he helped remove the melancholy of the poor Bohemians in that garret in Paris with this lively tuneful melody of the fabled Parisian nightspot Maxims. A bit of Mozart followed with “La ci darem la mano” from Don Giovanni with Hanna Ludwig, mezzo soprano and Pawel Konik, bass baritone. Konik’s beguiling basso caught the soul of Zerlina, whose saucy and sparkling mezzo became entangled in his basso lasso. The reluctant bride yielded big time to her new suitor as they ran offstage together with her leading the way. Betty Cooper Wallerstein, Louise Simmons and Robert Funck presented the awards. Daniel Bates sang “Una furtiva lagrima” from Donizetti’s Elisir d’amore. His is a purely “American” sound and recalled such tenors as James Melton, Charles Kullmann, Dennis Day and Jerry Hadley. Bates sang in a straightforward manner – sweet but not saccharine including a strong cadenza and finale. The award was given by Amazon.com, Inc. in memory of Glen Gary. Sava Vemic-tall and imposing, sang a noble and glorious” A te l’estremo addio – Il lacerato Spirito” from Verdi’s Simone Boccanegra. His basso cantante was thrilling to hear for those who long for the days when Pinza and Siepi reigned. Mr. Vemic will be making his Met Opera debut as the High Priest in Nabucco this season. His “Prego Maria, per me” haunts the memory! The award was given by Stephen De Maio, President of the Gerda Lissner Foundation in which Vemic was a first prize winner. We heard Mr. Vemic sing at Rose Hall recently with Maestro Eve Queler’s Opera Orchestra in Donizetti’s Parisina d’Este. Maestro Queler was also present at the Gari Gala. Lastly, first prizewinner Vanessa Vasquez, sang “Un bel di” from Puccini’s Madama Butterfly. Her soprano is clarion and powerful. Ms. Vasquez sang softly, much of the time and was a model of restraint. It was a reflective performance rather than an “all out” one. It was full of hope on the cusp of rage; more self-deceit than selflessness. Surely like the great Licia Albanese whose advice was “singing on the word” will help the promising Ms. Vasquez evolve into the perfect Butterfly. Ms. Vasquez’s award was given by Dr. Lya Friedrich Pfeifer, President of the Max Kade Foundation. 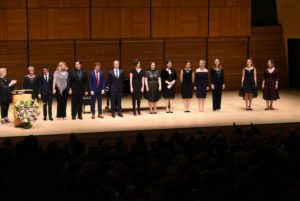 The gifted pianists were Jonathan Kelley who appeared courtesy of the Metropolitan Opera and Arlene Shrut, both of whose accompaniments to the singers was sheer perfection. We then all went into the dining room where great food, wines and desserts awaited one and all. As we entered we saw legendary Met dramatic soprano Elinor Ross, unforgettable Met mezzo Rosalind Elias and renowned coloratura soprano Harolyn Blackwell. Writer and stage designer Scott Barnes who was wearing his famous “bumble bee” pin was busy as a bee while buzzing around the festivities! At our table we enjoyed the delightful company of Catherine Malfitano and her debonair husband Steve, the effervescent Sachi Liebergesell, President of the Licia Albanese-Puccini Foundation and family and the urbane Michael Fornabaio from the Gerda Lissner Foundation. Many admirers stopped by our table to meet and greet Ms. Malfitano whose fans and admirers were thrilled to express their admiration. I cherish her internationally viewed Tosca with Placido Domingo on location in Rome as well as performances at New York City Opera and the Metropolitan Opera. There were many luminaries and friends in the audience. 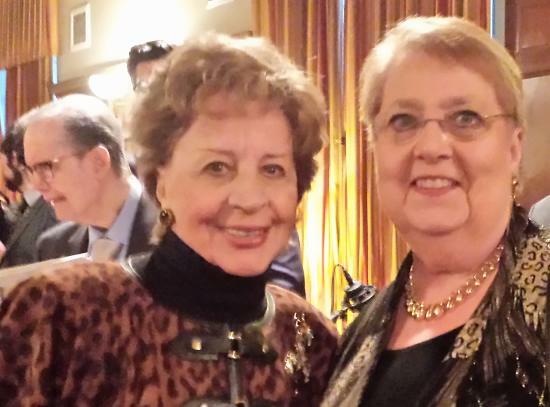 Sopranos and vocal judges Barbara Ann Testa and Teresa Apolei, Brooklyn born and bred soprano Elaine Malbin, who recorded with Mario Lanza and sang at New York City Opera and was a television pioneer with NBC Opera. Brooklynites Maestro Jan Wnek, Bill Ronayne, President of the Mario Lanza Society located in Brooklyn, Ken Benson, opera manager, Lou Barrella, noted educator and opera lecturer also from Brooklyn and Italian teacher/translator Cav. Edward Jackson, tenor Keith Johnson, Eva De La O from Musica Camera, Meche Kroop, chef/writer all marveling at the talent displayed by the young performers. Cornelia Beigel, Secretary of the Gerda Lissner Foundation lent her vivacious presence. Opera Index President Jane Shaulis and husband Executive Director Joseph Gasperec, composer and Vice Presidents Philip Hagemann and Janet Stovin and Treasurer Murray Rosenthal were all excited about the new awardees. Nedra Zachary and Peter Hubner from the Loren L. Zachary Society for the Performing Arts in Los Angeles flew in for this splendid occasion. 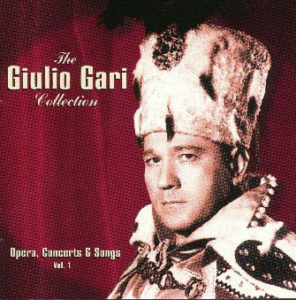 Some background recordings by Giulio Gari were played including his brilliant “Celeste Aida” and clips from a future documentary on his life was also shown. Gari sang at both the New York City Opera and the Metropolitan Opera in the 1950’s and 1960’s and was loved for his voice and generosity. The crowd of several hundred were inspired by the voices of the past and the bright talented young voices of the future. This foundation through his widow Gloria Gari fulfills Giulio’s dream of helping young singers in their careers as well as keeping opera alive and vital for the future. These are, of course, the same fragrances that they savored, and in the instances of family, were in the airs of yesterdays that we once shared. When my brother died early last year, unexpectedly, just a month shy of his sixtieth birthday, I suddenly flashed on when we were kids, in the 1960s. He was seven years older than me–that soon, will change forever–but we shared certain predilections. I went to Pathmark instead, and cooked another one of my brother’s unusual favorites: hot dogs and tater tots! The flavors of childhood, of course, can endure. Just a couple of summers ago, I sent my brother a recipe that had eluded us, directions for my mother’s perfect tomato meat sauce. It had been a staple of our lives for a couple of decades, but for some reason, in the early 1980s, she refused to make it any longer. Nor, when I finally asked, could she fully remember the exact method of her concoction. Suddenly, a few years back, I remembered that she once told me that she had originally based the recipe on one she found in Esquire magazine in the 1950s. I figured that Esquire must have published, at some point, a collection of their best recipes. A quick check at Amazon.com showed that I was right. When I later made it for my Mom, it was the first time in thirty years that her home was filled with the same delicious atmosphere that we had once enjoyed. My tributes and emulations can be far simpler. When one actor friend died a few years ago, who favored single-malt scotch, I bought a bottle, and toasted his memory. Earlier this year, I was delighted to discover that the Hal-vah candy that my father favored, was back in supermarkets. It is said that we cannot talk to the dead. But it is fascinating to realize that we can indeed share a meal with them. James H. (Jim) Burns, is a writer/actor living in New York. 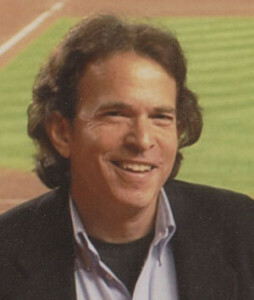 He has written features for such magazines as GENTLEMAN’S QUARTERLY, ESQUIRE, HEAVY METAL and TWILIGHT ZONE; and Op-Eds or essays for NEWSDAY, THE VILLAGE VOICE, THE SPORTING NEWS and THE NEW YORK TIMES. He has become active in radio, and contributed to Broadway, and Off-Broadway, productions.